Our summer lessons take place in our center in Castelldefels (one hour via public transport), as there are no waves in Barcelona. Lessons are available daily. On weekdays, they start at 4:00 p.m. and 6:00 p.m. On weekends, we offer lessons at 10:00 a.m. and 12:30 p.m. Important note: Please arrive at the school 15-20 minutes before the lesson starts. Please stay in touch with us, as we are constantly monitoring the weather forecast to check for the right waves. You should bring a towel, swimwear (close-fitting as it is more comfortable under a wetsuit), flip-flops, sunscreen, and water shoes in winter. All equipment is included in the surf lesson. In addition to a surf or paddleboard, we will provide you with a wetsuit. If you already have some surfing experience, the instructor will ask you some questions to get an idea of your level of knowledge to see whether there are any aspects you need to review. Last stop on the L94 bus. Grab your boardies, get in the soup, and leave the frubes behind. Not a surfer yet? Learn to master the waves and the surfing language with a 2-hour surfing lesson. 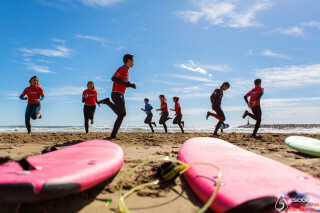 At our surf school, we provide students with a solid introduction to surfing, equip them with the right gear, and give them confidence in and out of the water. We’ve been training the best surfers since 2003 through engaging and effective lessons. The 2-hour surfing session is ideal for surfers of all levels. 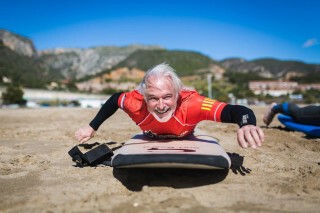 From your first day on a board to the proficient wave-watcher, we aim to help you get the most out of your surfing in our center in Castelldefels. Our lessons are always dynamic and fun, covering topics such as safety, steering, catching waves, and even mastering advanced moves. Under the guidance of our top-class instructors, you will quickly grow to be more independent on the water. During the lesson you will recognize and handle different types of waves, master paddling technique, and, most importantly, have an amazing time surfing. Our school is based in two locations near the city, easily reachable by car, bus, or train from the city center. Both beaches have shallow waters with just the right sized waves, making them some of the most ideal spots for surfing classes in Spain. We have our own channels on the watermarked with buoys, where you can surf far away from swimmers and boats. Of course, we also provide necessary facilities and equipment including wetsuits. 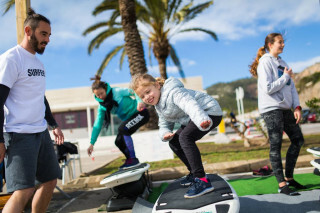 Whether these will be your first surfing steps or you are looking for improvement, the 2-hour surfing session promises a fun and rewarding experience. Take your stay in Barcelona to a new level and catch some gnarly waves!